“For the fourth consecutive election cycle, several elected officials and candidates for office have signed a pledge to protect the Rural Crescent in Prince William County. 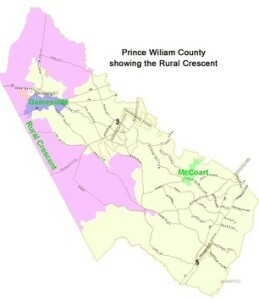 “Eleven candidates for office in 2011, including incumbents Michael C. May, R-Occoquan, and Frank J. Principi, D-Woodbridge, agreed to protect a crescent-shaped swath of rural land in western Prince William that was first recognized by the county supervisors in a 1998 comprehensive plan amendment. “Board chairman candidates John Gray and Babur Lateef signed the pledge, as did Gainesville candidates Martha Hendley, Michael High, Suzanne Miller and Ann Wheeler, Brentsville candidate Jeanine Lawson and Coles candidates Bob Pugh and Anthony Arnold. “On Thursday, seven of those candidates reaffirmed their commitment to the pledge at McCoart Government Center. The candidates cited everything from keeping taxes lower to preserving a rural lifestyle as reasons for supporting the Rural Crescent, which allows one home per 10 acres. ” ‘I found that when knocking on doors in the Linton Hall corridor, everybody didn’t live in the Rural Crescent but said “we love the Rural Crescent and value it and appreciate it,” ‘ Lawson added. “The Rural Crescent made headlines last year when the Board of County Supervisors voted 5 to 3 for the approval of the Avendale residential development off Vint Hill Road, which serves as one of the borders of the Rural Crescent. Principi, May and outgoing Gainesville Supervisor John T. Stirrup voted against approving the 300-home community. “Avendale included developer provided proffer funding to help pay for the realignment of the Vint Hill Road-Va. 28 intersection, one of the reasons Brentsville Supervisor W.S. ‘Wally’ Covington III chose to vote for it. County staff supported the comprehensive plan amendment and zoning change allowing for the development, stating that the boundary lines of the Rural Crescent could change based on where the Vint Hill intersection would be relocated. “After the vote, the board approved a resolution stating its commitment to keeping the rest of the Rural Crescent rural in character. Board Chairman Corey Stewart said [the] vote on Avendale does not set a precedent for future high impact development in the Rural Crescent. “Miller provided one of the more unique answers to preserve the Rural Crescent. The Gainesville Republican sees the area as an educational tool for her children and a way for families to preserve the ability to provide locally grown food on their own soil. “I’d like to thank all of you for coming today – Advocates for the Rural Crescent (ARC), the county supervisor candidates who have signed the pledge to protect the Rural Crescent, and the news media. “My name is Ralph Stephenson and I represent Prince William Citizens for Balanced Growth (PWCBG). Prince William Citizens for Balanced Growth is an alliance of networked friends, families, neighbors, local officials, and concerned citizens from both parties who live in Prince William County. We came together in opposition to the ill-considered 2006 ‘Brentswood’ rezoning proposal. We’ve been active in county land use issues ever since. That’s how we got started. But we’re not finished. There is still much that needs to be done. “PWCBG does not endorse any candidate or any party; we know that voters must consider multiple factors when deciding how and for whom to vote. But we do keep track of supervisor and candidate votes and positions on balanced growth issues. My congratulations to Supervisors Mike May and John Stirrup for achieving the best balanced growth records during the 2007-11 period. At the same time, I express my disappointment in Supervisors Marty Nohe and Wally Covington for achieving the worst balanced growth records during that period. Again, see http://pwcbg.org for more details. “If balanced growth seems a small issue, or only a local issue, let me point out at this time that the Great Recession from which our country has been struggling to recover for four years now was brought on by, among other things: massive housing oversupply (probably the single biggest cause); political shenanigans by local and federal government officials allied to the housing industry, trying to keep demand artificially high to match the artificially high housing supply; and dishonest and predatory lending practices by many mortgage lenders to people who couldn’t afford the homes they were being sold, as well as the financially toxic effect of those millions of now-non-performing (bad) loans on the books of banks and other investors.